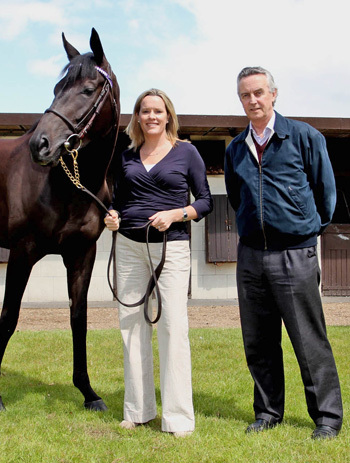 Genomics scientist Dr Emmeline Hill and Irish racehorse trainer and breeder Jim Bolger with Banimpire, a multiple-Group race winning racehorse. Hill and Bolger are the co-founders of Equinome. Irish biotechnology company Equinome, which first hit the headlines four years ago with its speed gene analysis for thoroughbreds, has announced a new test it says more accurately predicts elite flat-race performance. Equinome says the new test more than doubles the accuracy of predicting elite thoroughbred racing potential than if using pedigree alone. The test was developed by Equinome’s researchers, led by Dr Emmeline Hill, using genetic information from the DNA of more than 2000 thoroughbreds from Europe, Australasia, South Africa and North America, including more than 500 elite racehorses with handicap ratings over 100. The test scans 70,000 genetic variants on every horse submitted for analysis – more than any other test currently on the market – in search of those relevant to elite performance. Equinome, a University College Dublin spin-out company, was co-founded in 2009 by Hill and renowned Irish horse trainer and breeder Jim Bolger. Hill explains: “The test was developed using modified statistical algorithms that have been so successfully applied to livestock animal breeding. Studies have shown that the genetic requirements for sprinters are different than those of stayers, so the test narrows the focus to genes most relevant to sprinters, middle-distance or stayers to produce what Equinome calls a Genomic Racing Value. Additional scores are provided for sprint, middle-distance and stamina ability to provide an insight into an individual’s specific strengths. The new test also provides a Genomic Breeding Value that represents the potential for a broodmare or stallion to produce offspring with a greater aptitude for elite success based on the number of favourable genetic variants an individual may pass on to their progeny. Equinome said that, of the 590 thoroughbreds tested in advance of the 2014 yearling sales in Australia, those with the highest genetic score were nine times more likely to have won a race at two years old than if they had the lowest genetic score. Hill said genetics should be recognised as one of many components that contribute to the development of an elite racehorse. “As the technology continues to develop, genetic information will become increasingly important to maintain a competitive edge,” she said.